This interesting surname of some antiquity derives from the Old Germanic personal name Bertram, a compound of the elements "berht", bright or famous, plus "hrabn", raven. The raven was the bird of Odin, King of the gods, in Germanic mythology. The given name was popular in France throughout the Middle Ages where the forms Bertran(d) Bartram and Bertran developed. 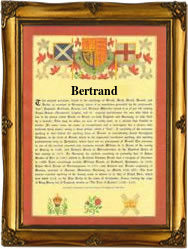 It was introduced into England by the Normans and "Bertrannus" (without surname) appears in the Domesday Book of 1086. The surname was also recorded at this time, (see below). One Henry Bertran was noted in "Documents relating to the Danelaw", (London circa 1155), and a Robert Bartram appears in the "Hundred Rolls of Norfolk", dated 1273. In the "Modern" idiom the surname has twelve spelling variations including Bartrum, Bertrand, Barrim, Batterham, Bothram etc.. A Coat of Arms granted to Bartram family of Newcastle, Northumberland, in 1433, depicts a blue orle on a gold'shield. The orle is an inner border that does not touch the Extremities of the shield, and the voided centre allows the field to be seen. The first recorded spelling of the family name is shown to be that of William Bertram, which was dated 1086, in the Domesday Book for Hampshire, during the reign of King William 1, known as "The Conqueror", 1066 - 1087. Surnames became necessary when governments introduced personal taxation. In England this was known as Poll Tax. Throughout the centuries, surnames in every country have continued to "develop" often leading to astonishing variants of the original spelling.